Praying For Baby David and the Del Risco Family! Some really difficult things happen to the best people. Today (10/23) is one of those days. Just a week ago (10/16) Nick and Gisela Del Risco gave birth to their third child. David is a tiny blessing that came five weeks early. Today, the doctors diagnosed David with Down Syndrome and as is common in children with Down Syndrome they are concerned with what may be heart problems. Nick and Gisela are not young and early on they were encouraged to have an abortion. As their Rabbi I am so proud of them for having the courage to choose life. We are praying today that God will heal David's heart and that there will not be any further complications. David means "Beloved of God" and Yeshua is deeply in love with this child as will be anyone who meets him. Nick just got a promotion at work three weeks ago but is under significant stress in the beginning of a nine-month training. At the end of the training is a test that will determine if he keeps this promotion. Elizabeth and Jonathan definitely know things are not right as their brother is having to stay in the hospital. Jonathan already has toys set up for his little brother and they all want little David to go home. Gisela is quite a strong little lady. There is not a more difficult role than the mother who is responsible to nurture, feed and protect this new life. So, friends, please pray with us. Pray that God will move in David's life and heal his heart and help him to be strong. Nick and Gisela were so moved by all the people from our synagogue that have already stepped up and in to help. We plan to walk this out with the Del Risco family and do our best to take care of them. We hope together. We pray together. Gisela said they named him David and he is already fighting to slay giants and her faith inspires me to trust God more. 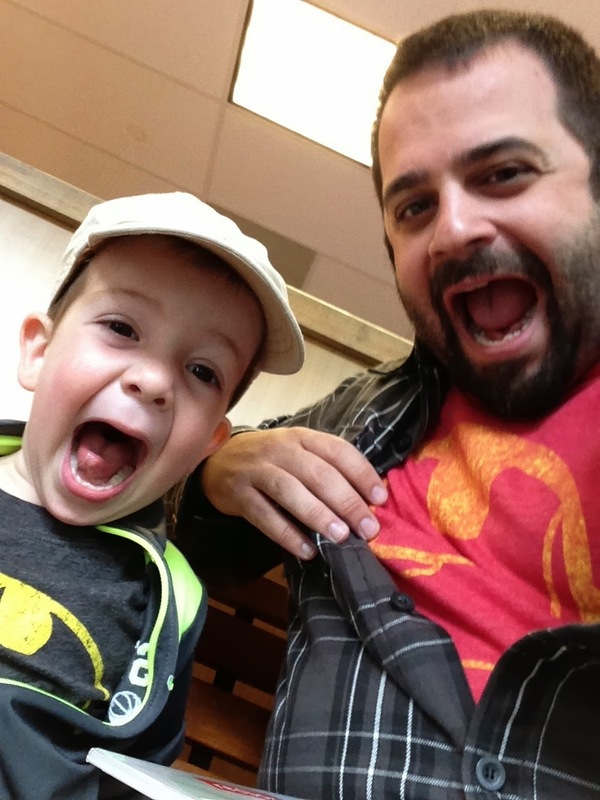 My prayer is little David will grow and bring massive amounts of joy to his family and our synagogue. Today, we choose life for David and the Del Risco family and we choose to seek the face of God and give Yeshua an opportunity to do what He does best. He weeps, He cries, He hears, He heals, He sees and above all He has a future for this wonderful new life! In the process of all that is happening for the Del Risco family, Nick lost his promotion at work. At this time, it is not such a bad thing as it removes some stree for Nick and the family. The Doctors want to wait 6 weeks (from 10/16) to determine the next steps for little David and his heart. Let's keep praying for the David and the whole Del Risco family. We are believing God with them for great miracles! I spent some time with Gisella in the hospital today with David. Great news…the hole in David’s heart is healing on its own. In fact, it is so small that they are confident it will not be issue. With that, David will be going home tomorrow (Friday, Nov. 8th). Please keep praying for David’s health and for Nick & Gisella that God will give them wisdom with all they have on thier plate! Pray for Elizabeth and Jonathan (big sister and brother) as well! This Shabbat (1/18/14) we are having a bady dedication for David and his siblings, Elizabeth & Jonathan. David is doing very well and the Del Risco's have been so encouraged by the love and support of so many! What a blessing this wonderful family is to our community! 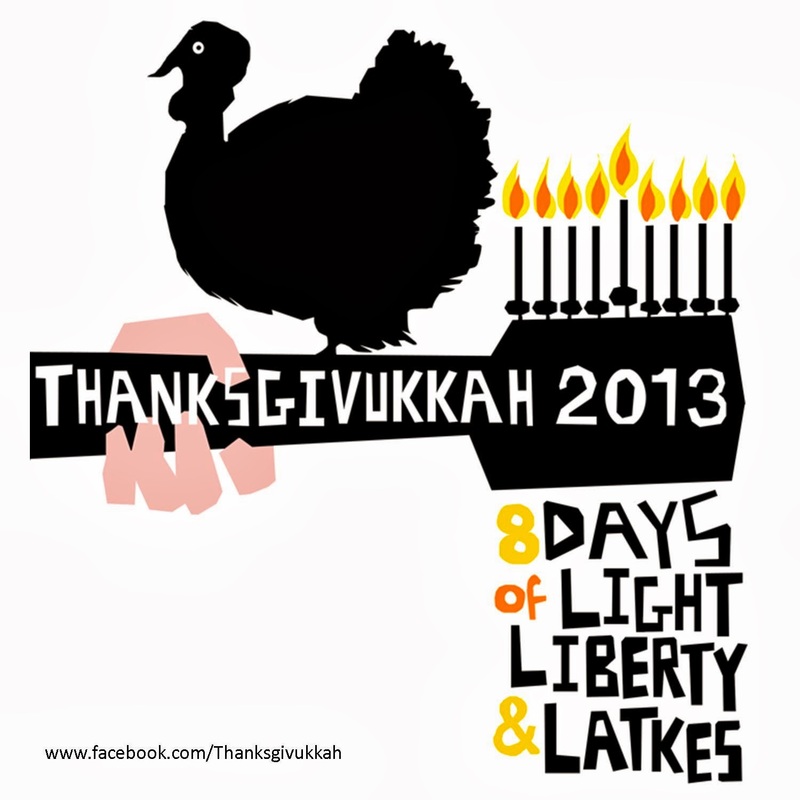 Thanksgivukkah: Pass The Cranberry Sauce and Latkes! On November 28th of this year we will celebrate an incredible combination of holidays that is being called Thanksgivukkah. 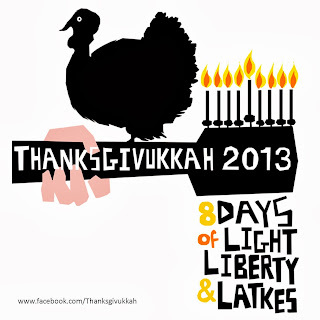 Thanksgivukkah is far less common than other combo holidays such as Christmahanakwanzika and Chrismukkah. In fact, for only the second time in history Hanukkah and Thanksgiving fall on the same day on the standard calendar! The last time was 1888 and some are saying the next time will not be for another 79,000 years! By that time menorahs will probably light themselves and turkeys will most likely be extinct, so, my advice for Thanksgivukkah 2013 is celebrate! Before I give you some tips how, let me tell you some of the history according to Wikipedia. Hanukkah, also known as the Festival of Lights and Feast of Dedication, is an eight-day Jewish holiday commemorating the rededication of the Holy Temple (the Second Temple) in Jerusalem at the time of the Maccabean Revolt against the Greeks of the 2nd century BC. Hanukkah is observed for eight nights and days, starting on the 25th day of Kislev according to the Hebrew calendar, which may occur at any time from late November to late December in the Gregorian calendar. Many believe that Thanksgiving goes back to a celebration of the day in 1621 at Plymouth, Massachusetts. But, from the time of the Founding Fathers until the time of the civil war, the date Thanksgiving was observed varied from state to state. The final Thursday in November had become the customary date in most U.S. states by the beginning of the 19th century. Thanksgiving was first celebrated on the same date by all states in 1863 by a presidential proclamation of Abraham Lincoln. It wasn't until December 26, 1941, that President Franklin D. Roosevelt signed a joint resolution of Congress changing the national Thanksgiving Day from the last Thursday in November to the fourth Thursday. For the first time in a long time and for the last time in a long time to come, the convergence of the earliest date for Hanukkah on the Jewish calendar and the American date of Thanksgiving gives us a once-in-a-lifetime chance to celebrate Thanksgivukkah. People are going crazy for Thanksgivukkah. You can buy Thanksgivukkah T-shirts; you find special Thanksgivukkah recipes (whose not excited for latkes & cranberry sauce?!) and you can even light a Menurky. 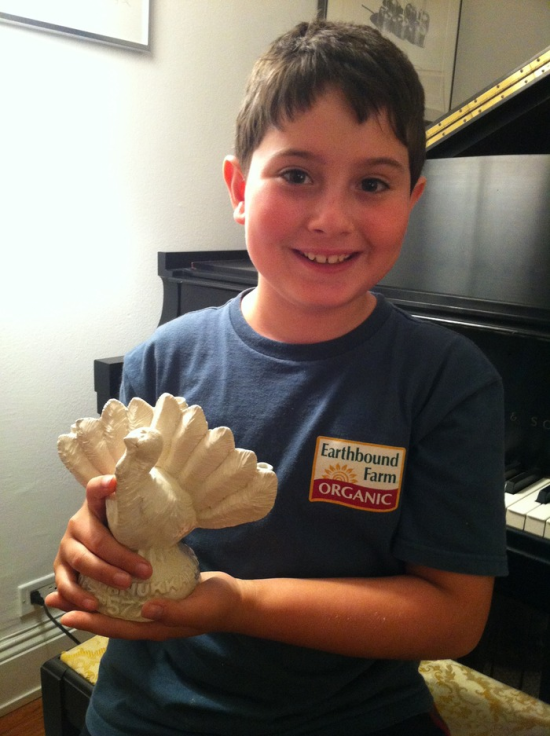 That's right, a nine year old boy raised $48,000 on Kickstarter to make menorahs shaped like turkeys just for this special year. But, don't order too late (ours is on its way); it will only work this year! Thanksgivukkah is all over the news and Stephen Colbert is concerned that Hanukkah is stealing Thanksgiving's thunder. But the beauty of this day is it's a one-time event and these two holidays fit so well together. Hanukkah is a time of rededication to God. As the Temple was rededicated so we take time to rededicate our lives to following Yeshua. Thanksgiving is time to thank God for all that He has given us in harvest, in family and friends, and for living in such a wonderful country where we can worship in freedom. So, this year, on Thanksgivukkah, eat latkes with cranberry sauce, play dreidel with family and friends while the candles of your Menurkey burn bright, enjoy turkey and Sufganiot (oil fried donuts for Hanukkah), sit at a big table with your favorite people and all kinds of Fall decorations everywhere. Above all, thank God for seasons like these that remind us of God's promise to never leave us, His people, Jews and Gentiles, men and women of every age. This Thanksgivukkah let's celebrate the awesomeness of God Who sent His son, Yeshua, to be a light to the world, and Who instructs us, His followers, to rededicate ourselves to God and be thankful for all the blessings in our lives. That is the meaning of Thanksgivukkah. Here is proof that I am happy all the time. 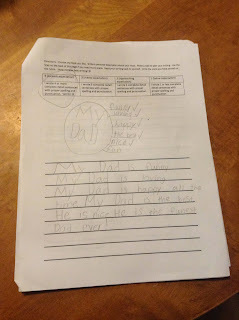 My daughter, Emma (7), wrote about me in her homework for this week. 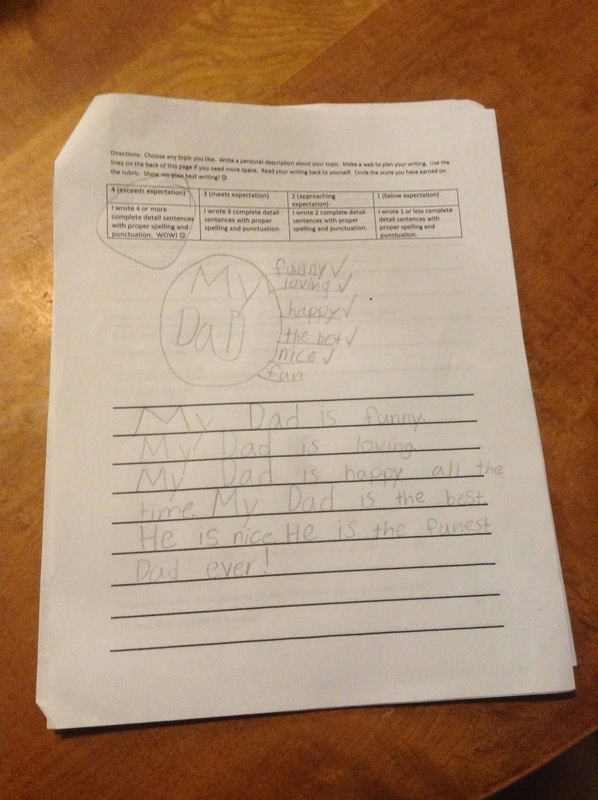 "My Dad is happy all the time" and it is usually true except for the times it is not. I am a big believer in the idea that meanings of name matter. It comes from the traditions of the Bible in which children were named based on what happened during pregnancy, birth, or a prophecy concerning their future decisions and life. When my mom was pregnant with me, a woman in the church (before Messianic Judaism) they were attending came up to her, put her hands on my mom's belly, and said "This will be a happy child." So my parents named me Matthew Asher. Matthew means "God's gift" and Asher means "Happy". So, together, my name means God's gift of happiness. My normal disposition is happy. I have many years of pictures with the same happy face and I am teaching the next generation the ways of the happy face. I love being happy. I have found that in the many circumstances of life there are all kinds of attempts to steal my happiness and joy. There are critics that don't like what I do, how I dress, my love for comic books, my love for movies, my love for God, etc. There is a whole spiritual realm that are the enemies of God that would love to see me depressed, sad, complaining and frustrated. There are some that say I shouldn't be so transparent and live my life so publicly. There are a variety opinions of how I should live my life. So, here it is: I am happy! I can't help but be happy because of the grace and mercy of God on my life. I can't help but be happy because I have a beautiful wife, Laura, and God has given us three awesome kids. I can't help but be happy because I don't deserve anything that I have in life; yet, God saw fit to give all of it to me. I can't help but be happy because I serve an amazing congregation, Beit Messiah, in a super awesome city, Seattle. I follow Yeshua (Jesus) and I am happy because He gave His life for me so that I could follow Him with all of my heart, soul and strength...and He deserves all credit, glory, and honor for anything good that I am or do! I admit my goal is to not be like anyone who has come before me. I admit that I like to break "rules" for what a rabbi is supposed to look and act like. I am quite comfortable and confident in my own skin. I like myself. I like the way God made me. I recognize that without Yeshua I would still be stuck in, and defined by, my sin. I am happy because Yeshua has set me free from the expectations of the world around me and wants me to live according to His expectations for me, which is to be awesome and bring Him glory. Word to the wise: don't try to steal my happiness. It won't work. I'm the Happy Rabbi. Are you happy? Are there people trying to steal your happiness? What do you do about it?